Capture the imagination of a friend or loved one with a hand tied bouquet of beautiful bright yellow sunflowers wrapped in brown paper or cello with a bow. A hand tied bunch of beautiful bright yellow sunflowers wrapped in brown paper or cello and finished off with a bow. 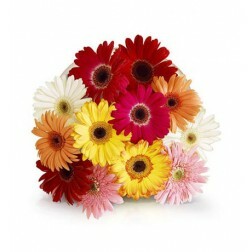 With this happy flower, says ‘I adore you’, brings cheer to everyone and is sure to turn any frown into a smile. Sunflowers are only available for same day delivery in Durban.